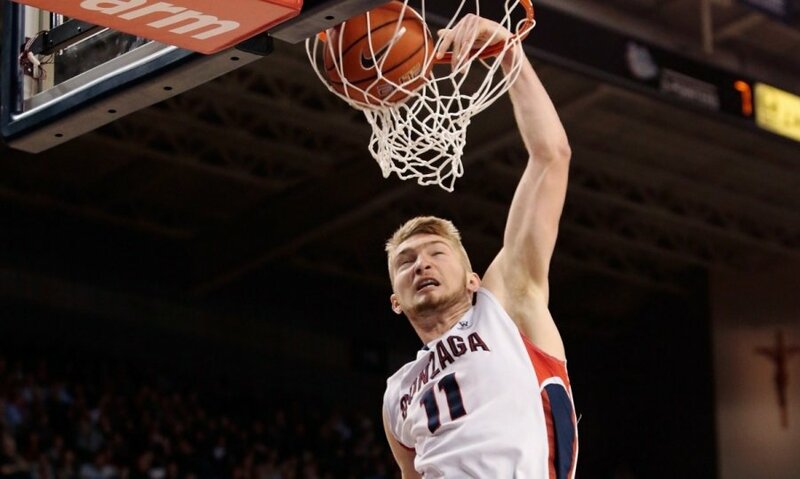 I recently had the pleasure of interviewing one of the great young prospects for the future in Lithuanian basketball, Domantas Sabonis. Son of former Lithuanian basketball great Arvydas Sabonis, Domantas is a very poised and intelligent young man in addition to being a great player. He respects his father's accomplishments, but definitely hopes to make his own name for himself outside of his father's very large shadow. At the elite basketball school Gonzaga University where he currently plays, he is doing just that. The 'Zags' are currently dominating the WCC conference with an amazing 26-1 record, in no small part due to the outstanding play of their Lithuanian freshman. He's currently averaging 10 points and 7 rebounds (team leading) off the bench. The discussion lasted 16-minutes long between class and basketball practice with 30 questions asked. The wide range of topics discussed included: how he's settling in at Gonzaga, their team's amazing run, as well as his future with the Lithuanian National team, the NBA and much more. The one question I think every Lithuanian basketball fan on the planet wanted to ask was if he would join the national team in the future. That question was answered definitively. You were born in the United States when your dad was a player for the Portland Trailblazers; how old were you when you moved to Lithuania ? Yes... I was like 5 or 6. I was really young. So you basically grew up in Lithuania? No. We would spend the summers there, but I grew up in Spain, the south (in the city of) Malaga. How do you like being in the United States for college? Can you briefly describe your college experience here at Gonzaga? I think it's great, it's been awesome so far. At first it was a bit difficult to get used to the transitions and stuff but the teammates the coaching staff, everyone at GU was real helpful and nice and that made it a lot easier. Yeah I miss them too but they've all been really supportive, they tell me to keep working hard. Did you get a chance to go over there for the holidays? Only when school finishes, that's when I'll go home . Outside of basketball, what are your interests? I don't really have a lot of interests. Apart from basketball, I love spending time with my family and friends, that's really important to me. What classes are you taking at Gonzaga, what's your major? My major is sports management. If basketball wasn't an option, what do you see yourself doing? I see myself doing sports management and basketball. Gonzaga is a really elite basketball school that has produced 11 NBA players including the great John Stockton, the all-time assists leader. Was this the main reason you chose to attend, or was there some other reason? This was a big reason because they've had great history with European players coming over and succeeding. Also I've been shown film about how they play and I really love how they share the ball and how they look for the big in the post. They play very unselfish. You are averaging nearly 10 points and 7 rebounds a game off the bench. That's very impressive. You are an extremely versatile power-forward with great low-post skills, excellent rebounding, cat-like agility plus an ever-improving jump-shot. What would you say though might be the biggest weakness of your game you need to work on? I think I have to work on my shot,improve it. Work on my (shooting) range and develop more confidence shooting. Maybe I would also say my dribbling and my defense. The Zags are currently 25-1 (at time of interview), 3rd in the nation. There's been some real blow-out victories too. How intense is the training you've received here at Gonzaga from coach Mark Few? It's been really intense. We have individual workouts with everyone doing their position. Practices are great because we work on what we need to improve. We take seriously the scouting report (on other teams) which then benefits us in the games. Is the training more intense here or in Lithuania? It's very similar... very similar. Some say that Gonzaga might benefit from conference realignment, which is playing in a different (stronger)conference than the WCC. No doubt Gonzaga would be elite in any conference, but do you think you guys might be a little more prepared for the NCAA tournament if you guys had to deal with some more adversity? What is the coach(Mark Few) doing to prepare you for when the competition gets tougher in the NCAA tournament? I personally think apart from our coaches we also have our seniors Gary Bell, Kevin Pangos and Byron Wesley. They're doing a great job because they've gone through this for years already they know what it's been (like) and everyday we're practicing and playing our WCC games for something more in the future. For the WCC tournament and the NCAA tournament. We take all of our practices seriously because we know that when the NCAA tournament comes it's going to be a completely different thing. I personally am buying in to the Zags making a deep run this year during March Madness. Do you think the Zags have a shot at the Final 4? I think that if we keep on working hard at it, playing how we do, doing the "Zag way", we might have a pretty good shot. First it depends on us though. Speaking of "elite basketball cultures", you come from a country and so did my ancestors as well, with one of the most elite basketball cultures in the entire world. Basketball is the national religion of Lithuania and this sport truly unites Lithuanians scattered all around the world. Why is a nation so small with only 3 million people such a basketball superpower? I just think, like you said basketball is Lithuania's religion. Any sport, like if a family has a kid... has a boy, the first thing they think about is taking him to (play) basketball. Everyone loves basketball in Lithuania, it's the biggest sport there is. I don't know it's just... everyone loves it. My theory as to why Lithuania is so good at basketball is that they emphasize the right way to play: (passing, defense, lack of personal ego, team play, size and skill in the front court, mental toughness, great coaching, and teaching the young players fundamentals). Which of those things do you agree with the most? I think teaching basketball the right way, the fundamentals. (Teaching kids) to make the right play, to be unselfish. (The Lithuanian way) is to always go at it 100 percent and be focused. To Lithuanians around the world, your dad is a national hero. He's a hero of mine. He and Šarūnas Marčiulonis used the power of basketball to unite a people devastated by occupation and to bring so much national pride back home by winning medals in the Olympics. What kind of basketball teacher was he for you and your brothers while you guys were growing up? I think (he) was great because he would teach us some things,but for the most part he would give us space let us do things in our own way (decide) our own future. After a game he would tell us maybe one or two details but he wouldn't be on us the whole time. That was great because he gave us space and we knew he trusted us the whole time. Can you just tell me a little bit about the Sabonis and Marčiulonis academies in Kaunas and Vilnius? How intense is the training there for young players? Well basically the Marčiulonis Academy and the Sabonis Academy are the main two places where kids go to (for basketball training). They are rivals in (their) league. They both do a great job, they both have the same purpose to make(young)players grow up and be the best that they can by teaching them the right fundamentals and the right way to play. I'm a firm believer that's part of the reason why Lithuania's been so good over the years. Do you agree with that, do you think that these elite schools that your dad and his friend Šarūnas Marčiulonis founded were part of the reason why Lithuania has maintained dominance in basketball? That's completely true... that's what I hear. What are the NCAA rules regarding playing for national teams while you attend Gonzaga? I don't really know the rules, but I know when I was recruited, when I committed to come here we told them that if I come here I have to be able to go to the national team sometimes and they completely agreed. They're fine with that because they've had other European bigs who'd done it before. Elias Harris, Karnowski... he's Polish, he plays for the Polish National team. If coach Kazlauskas gave you the call you would play for the national team? I don't know anything yet about this summer, playing with the National team... but yeah, I hope that one day I would make to the training camp, it would be awesome, it would be a great experience and I would love to learn (about basketball) by making the most out (of my time there). Your brothers are also quite good basketball players in their own right. Tautvydas and Žygimantas. Considering that the national team might be your best hope to have your brothers as your teammates, do you look forward to playing alongside them for Lithuania? Yeah that would be awesome. I've already had past experience playing with my brothers all on the same team in Spain. It was awesome and it was great. How proud would your dad be if all three of you were on the national team which took home a medal for Lithuania? That would be awesome, I think it would be one of his proudest moments. After a couple of tough losses to France in recent tournaments, what do you think Lithuania was missing or what do they need to do to close the gap in international competition? I don't really know how to answer that. After your college career is over at Gonzaga do you dream someday of playing in the NBA like your dad did? Yeah, I hope that one day I would (be able to) have that experience and be lucky enough to play in the NBA. There are many sons of former NBA players currently in the league like Steph Curry and Klay Thompson, do you think it helps to have the experience of having a dad as a former player being able to give advice? I think... yeah if my dad gives me advice it would help me a lot, he's a very experienced player, he was one of the greatest of all time and I think of course (he) could help me a lot. If you make it to the league how would you handle the pressure of these high expectations? I think with the expectations I'm kind of used to it. Since I was a kid everyone has been comparing me to my dad. They've been on me so particularly I don't really think about it... yeah I just go out and play my game. Who are your favorite NBA players? My dad and Larry Bird. What current NBA players do you compare your game the most to? I actually don't know, it's getting kind of late and I have practice in 10 minutes so I have to go get ready. Last question. What's more important to you: national honor and medals in international competition, or making money in the NBA? I guess it would be playing with my national team and getting the medals. Making my country proud. 'Ačiū labai' (Thank you) for your time. I sincerely wish you all the best in your career at Gonzaga and beyond, I know the Zags are going to make a great run in the NCAA tournament if you guys listen to coach Few and stay focused. I truly appreciate it! If no other questions got answered, the confirmation that he will play on the Lithuanian National team was a big deal to worldwide Lithuanians. 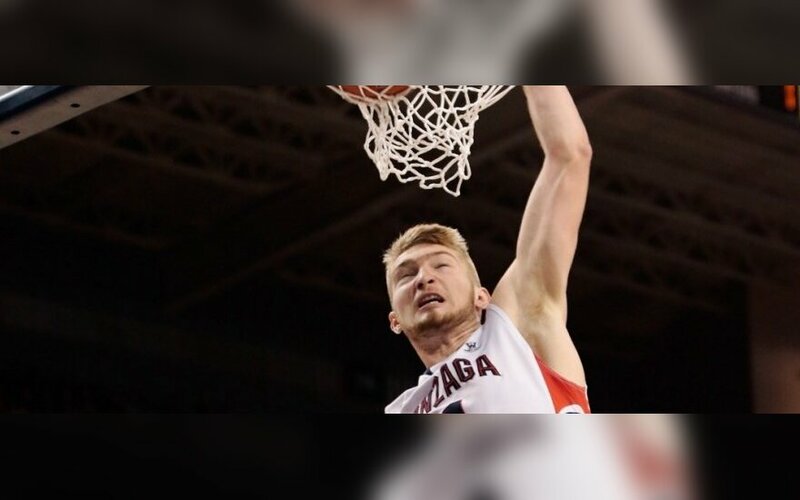 Not only did he say that someday he would play for the National Team, but it was also apparently a deal-breaker which Gonzaga had to agree to in order for him to commit to play his college ball there. 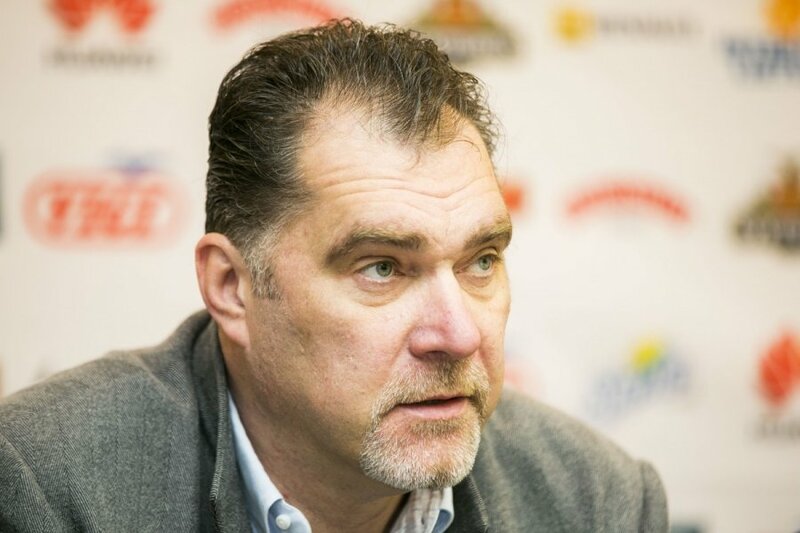 The son of Arvydas Sabonis looks forward to the day when he and his brothers might play together for the honor of Lithuania. 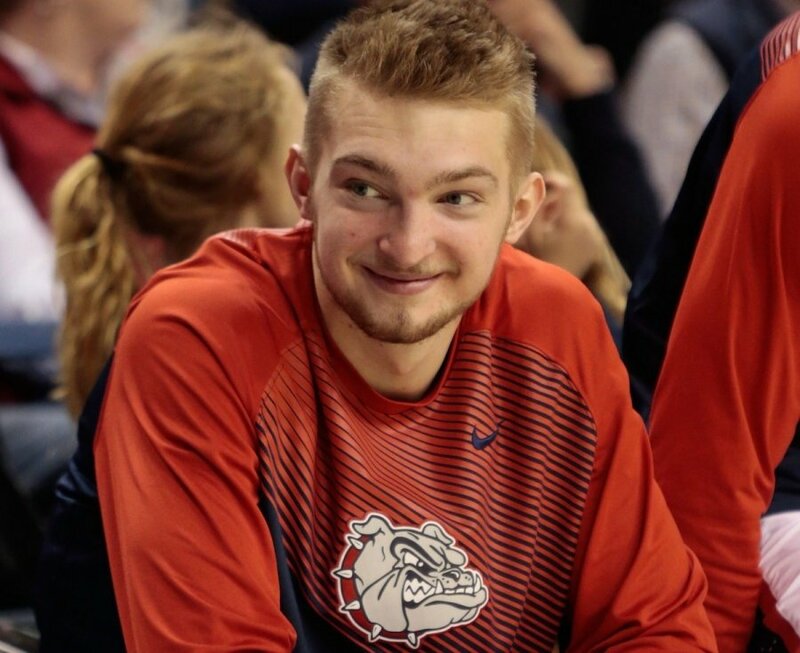 He also is bent on making a name for himself other than Arvydas Sabonis son. While he dreams of a career in the NBA, he also made clear that the pursuit of medals for Lithuania is a higher priority than fame and fortune for him. All in all it was a very insightful interview, one which I genuinely feel shed some light on the basketball prodigy who we know so little about yet, but surely will in the future if he keeps improving on his already very high level of play.